Other than mentioning sourdough breads, I’ve been doing lots of fermenting of food and not talking about it here. It started two years ago after I read Sandor Katz’s The Art of Fermentation and made lacto-fermented pickles for the first time. I was hooked. I loved that the sour flavor is a little different and a little more complex than what you get when pickling with vinegar. I’ve made lacto-fermented pickles with cucumbers, okra, peppers, and green beans, and I’ve made a fermented tomato salsa. And, it’s all so easy. For vegetables like cucumbers and okra, I start with a five percent brine and add garlic, dried hot chiles, and other spices like dill seed, and then the vegetables to be pickled are placed in the brine and held below the surface with jars or ramekins. It takes about four days for the fermentation process at room temperature. I still need to invest in a proper pickling crock with a weight that fits the top. A few months ago, I read Cultured Foods for Your Kitchen , and it gave me even more ideas for fermenting. But, let’s back up for a moment. You may be wondering, why ferment food at all? Traditionally, fermentation allowed foods to be preserved, but magically, it also offers a way of getting even more nutrition from food than you would without doing so. During fermentation, good bacteria are formed with all sorts of beneficial effects ranging from better absorption of nutrients to boosting the immune system. The only thing to keep in mind regarding fermentation is that those beneficial bacteria get killed off when exposed to high heat. I keep fermented pickles in the refrigerator for a couple of months if they even last that long. If they were heat-processed for canning and long-term storage, they’d still taste great but the beneficial bacteria would be killed off. Fermented foods, however, can be frozen and the good bacteria will survive. I mention this because the fermented cereal shown here was heated to a point that destroyed the good bacteria. In this case though, all was not lost. This recipe is from Cultured Foods for Your Kitchen, and in the head note, the Crunchy Buckwheat Cereal is compared to Grape Nuts. I’ve always loved Grape Nuts! When I was little, I used to sprinkle Grape Nuts cereal on my ice cream. It stayed crunchy until the end of the bowl. I couldn’t wait to make a homemade version or something similar. 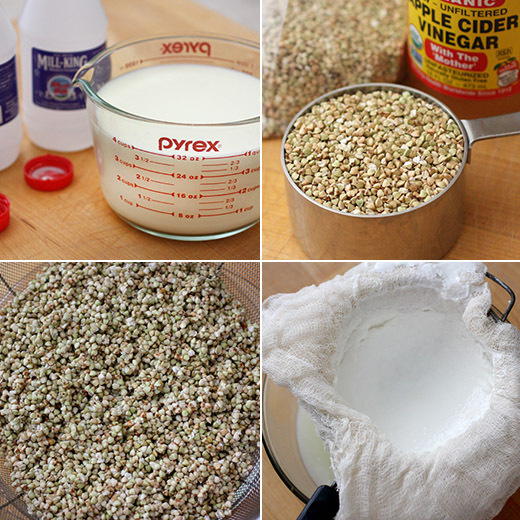 You begin with a couple of cups of untoasted whole buckwheat groats, and they were rinsed and drained. They were placed in a large bowl, a couple of tablespoons of raw apple cider vinegar were added, and the groats were covered with water. The bowl was covered with a dish towel, and it was left to ferment for two days. The buckwheat was then drained and rinsed, and I spread it on a baking sheet to dehydrate it in the oven. It took a little over two hours at 200 degrees F. Now, the reason this wasn’t such a bad thing even though the heat destroyed the beneficial bacteria produced during fermentation is because soaking grains before cooking makes them much more digestible and nutritious. Grains contain phytic acid which can block the absorption of minerals and enzyme inhibitors that can impede digestion. Soaking neutralizes phytic acid and breaks down the enzyme inhibitors. These benefits in the grain remain after cooking. There’s a side note in the book that explains this in detail and encourages you to always soak your grains before cooking even if just for a few hours. So, the soaked and fermented buckwheat groats were dried until crunchy in the oven, and then I added a teaspoon of cinnamon and stirred it through before storing the cereal. 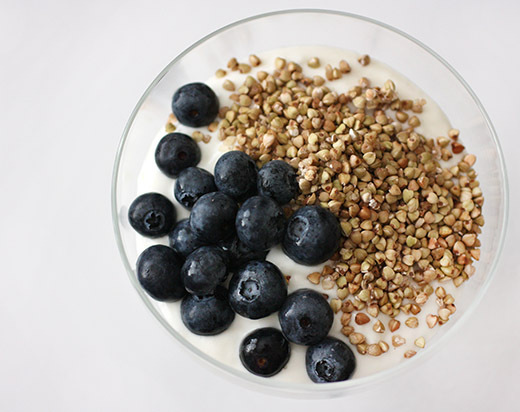 The second part of this breakfast is the yogurt which I finally succeeded at making at home. I used good, local milk; heated it to the proper temperature; let the temperature reduce; added some leftover yogurt; transferred it to a bowl and covered it; placed the bowl in the Wonderbag; and left it to ferment. 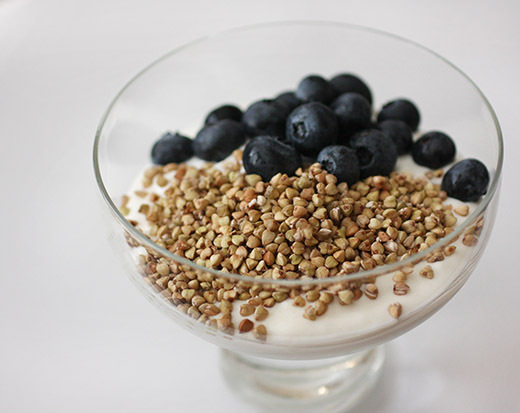 Once I had homemade yogurt, I chilled it and then strained it to make a thick Greek-style yogurt. I will say that this homemade buckwheat cereal isn’t exactly like Grape Nuts. I wondered if adding a little salt would make it seem more similar. But, it’s delightfully crunchy and makes a fantastic yogurt topping. As you see in the photos, I added some blueberries as well. And, I’m thrilled to have finally made homemade yogurt that didn’t fail. My fermenting will turn back to pickles next. I need to get okra and peppers in some brine before their season ends. I received a review copy of Anne-Sophie Pic’s newest book, Scook: The Complete Cookery Course . It’s a big, beautiful cookbook that she wrote to continue the tradition of passing along kitchen experience to new cooks. The recipes are some of her favorites from her childhood as well as her professional life in the kitchen. This new book is just as stunning as her previous book, Le Livre Blanc, which was focused on her incredible restaurant creations, but these recipes are much more doable by the home cook. There are even helpful step-by-step instructions with photos for some techniques. Pic is a third generation chef in her family, and she’s a three-Michelin starred chef at her restaurant Maison Pic in Valence, Drôme, France. This book is divided into categories like Entertaining, Everyday, and For Children. Some of the selections for each of these categories represent ideals that might not be quite realistic for everyone. Personally, I wouldn’t think of Foie Gras with Beetroot or Lobster and Celery with Red Fruits as “everyday” dishes, but the idea is that everything in this chapter is quick enough to prepare on an everyday basis. It’s meant as inspiration to elevate your game of go-to, quick dishes. I’m definitely inspired to try the Roman Gnocchi Revisited topped with a tomato concasse with capers and black olives. A recipe from the Entertaining chapter that I keep turning back to is for a Tuna Tartlet with Sauce Vierge. This reminds me of some tartlets I watched Dorie Greenspan make at a cooking class when she was promoting her book Around My French Table. Both Dorie’s tartlets and the ones in this book make use of the same technique for the pastry base. Puff pastry is cut into shapes and baked between two baking sheets to keep it pressed and flat. Then, the crisp, flaky pastry pieces get some delicious toppings. Tuna was used in both versions, but I’d love to try these with smoked salmon and Pic’s suggested black olive tapenade, Espelette chile powder, and basil. Tartlets continued to capture my attention, and when I saw the lovely, little Vegetable Tarts with Young Parmesan Cream I had to try a summery version. In the book, these golden pastry rounds are topped with incredibly perfect-looking spring vegetables and a drizzle of the parmesan cream. 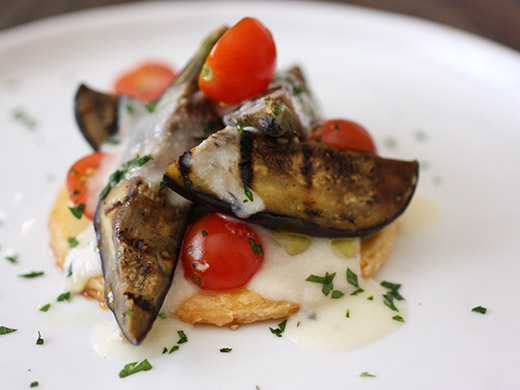 I wanted to summer-ize the concept by using some grilled baby eggplant and cherry tomatoes. The rich pastry dough was made with lots of butter, ground almonds, all-purpose flour, and salt. The recipe called for lavender flowers, but I didn’t have any handy. 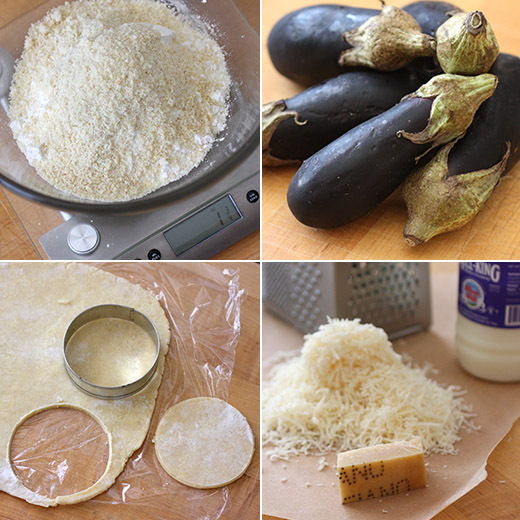 The dough was rolled thin and then covered with plastic wrap and placed in the freezer for 15 minutes. Once firm, rounds were cut, brushed with egg wash, and baked. The parmesan cream was a simple mix of grated parmesan and milk that was heated in a saucepan and blended. Mine seemed thin, so I made a roux and whisked in the mixture to thicken it. I grilled quartered, little eggplants for the main topping. They were set on the pastry rounds with halved cherry tomatoes, drizzled with olive oil, and topped with the parmesan cream. Anne-Sophie Pic writes that she hopes the reader becomes comfortable with these dishes and makes the recipes his/her own. 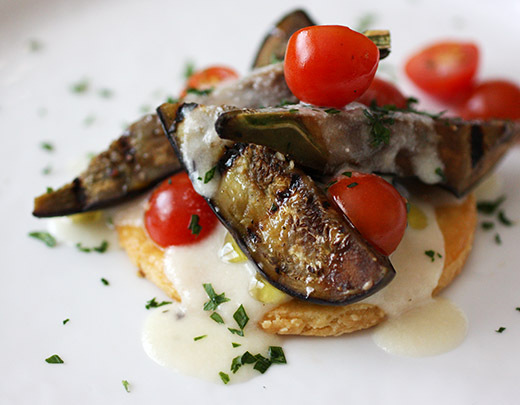 Switching out the vegetables for this tart was an easy change, and the parmesan cream would be a delicious accompaniment to just about any vegetable. This is a fun book to curl up with and page through the photos. And, there’s lots to learn from it too.